Defend your country's honor by competing against the world's best cricket players. 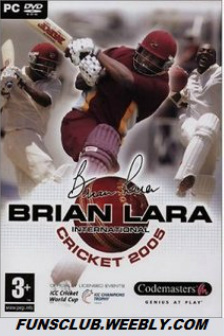 Brian Lara International Cricket 2005 tests your batting and bowling skills in matches held all around the world. Step up to the crease and choose to play in a One-Day International offering a vibrant quick fix of cricket. You can select how many overs are played, up to a maximum of 50, meaning you can create a 20:20 slog fest too. Alternatively, immerse yourself in the classic atmosphere of Test Match, with a 5-day Test in all 10 test-playing nations. Also in Exhibition is Double Wicket providing a very accessible and customisable game with two cricketers on each side. Time to get serious and compete in the ICC’s official tournaments. Meet the best in the world in the ICC Cricket World Cup, featuring 14 limited-overs national teams, or take part in the ICC Champions Trophy with all the One-Day International nations in a concentrated round-robin competition. The Tournament mode also offers World Tour, where you take your team on a world tour playing Test matches and One-Day Internationals across the globe. Then there’s the World XI Series, featuring customised teams from around the world including Asian, African, Northern & Southern Hemisphere XIs and, ultimately, the World XI. Finally, there’s a Double Wicket Tournament for up to 16 players to compete in short snappy cricket matches. When you reckon you’re the best, the Challenge mode is where you can really show off. The Classic Match mode delivers 10 scenarios where you take over a genuine historic match at a critical point and see if you can pull off, or better, the same amazing cricketing feats as your real-life counterparts. There’s also the World XI Challenge, which has you playing as every international team versus the world’s best XI, and the Classic XI Challenge for you to pit your selected World XI against history’s greatest players in the ultimate cricketing test! To help you perfect your skills, Coaching offers The Nets, a comprehensive training facility for bowling and batting. Having trouble performing a square cut? Select a fast bowler to only bowl short and wide outside the off stump and in no time you will be launching exquisitely timed square cuts to the boundary in crucial fixtures. Create your own Career Player to represent your nation in every available mode. You can select real licensed kit manufacturers - including Slazenger, Kookaburra, Duncan Fearnley. You can even set your player’s specialist skills, be it as a batsman, bowler or all-rounder, and determine if your player needs to have sun-cream applied! Through performing well, you can earn stat points to improve your player’s abilities. Using the Custom Squad option, build your dream XI from all the players featured. You can even design your own tournaments and leagues using the Custom League or Cup mode. The Pavilion mode is somewhere to relax after a day at the crease. Here your achievements on the field unlocks classic players and photography of historic cricketing moments. The Records show off hundreds of One-Day, Fielding, Batting, Bowling, and Team records. Finally, there are three Trophy cabinets to fill with silverware, including the ICC Cricket World Cup and ICC Champion’s Trophy. 1.Burn or mount with Daemon tools. 3.Copy the cracked content located in the \Crack directory on the Data toyour installation directory.